Dempsey King will be traveling to the NCAA Championships for the second time in his RIT wrestling career. Dempsey King, a fourth-year civil engineering technology student from New Hartford, N.Y., is one of three RIT wrestlers who qualified for the 2019 NCAA Division III Championship tournament. King and his two teammates—Kaidon Winters, a second-year mechanical engineering technology student, and Connor Calkins, a fourth-year exercise science student—will travel to the Berglund Center in Roanoke, Va., from March 8-9 to compete. This will be the third consecutive season that RIT has sent three student-athletes to nationals, and King’s second time competing for RIT at the national level. King, who started wrestling in third grade and is now ranked sixth nationally, has an overall record of 24-5 for this season. During the regional qualifiers, he got a bye the first round, won 12-0 in the quarterfinals and won 4-0 in the semifinals. He did not compete in the finals due to a medical forfeit, but he will be fully healed in time to compete in the national tournament. The RIT wrestling team has had a very successful season leading up to the national championship. This year, the team made RIT history by winning 12 dual matches in one season, the most dual match wins the wrestling team has had in one season during the 91 years of wrestling on campus. During the NCAA Mideast Regional qualifiers, RIT finished fourth out of 18 teams and scored 96.5 points, the best finish RIT has received at the regional level. 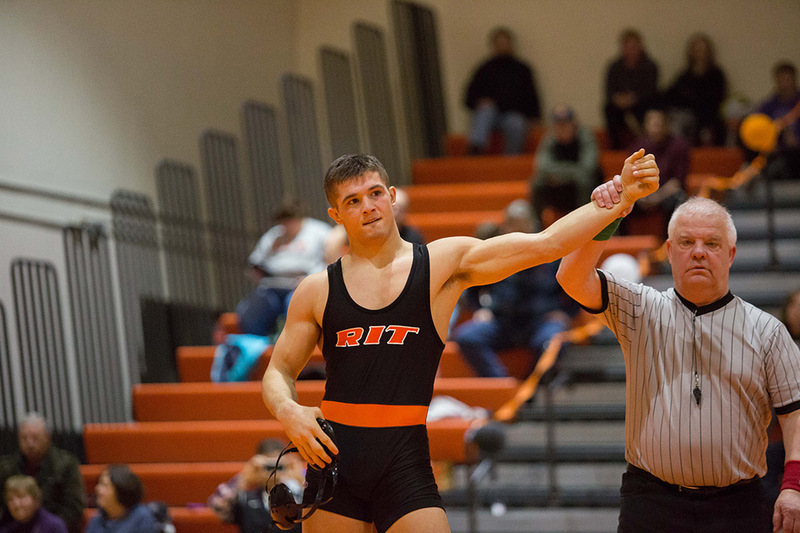 For more information about the RIT wrestling team, go to https://www.ritathletics.com/index.aspx?path=wres. Question: Why did you choose to come to RIT? Answer: I really liked the co-op program and I had an idea coming out of high school that I wanted to do civil engineering or something along those lines. RIT obviously has a good civil engineering program, and, when comparing it with other universities, I really enjoyed the opportunities provided through the co-op program. I thought it would help me a lot. As far as wrestling goes, I would definitely say Coach Bovenzi, who was the assistant coach at the time and is now the head coach, definitely attracted me to the university. I was looking at universities that had civil engineering programs as well as a good wrestling program. RIT ended up having the best of both. Question: What do you like most about being on the RIT wrestling team? Answer: I think the best aspect of our team is definitely the guys, our comradery and culture. When you join the team, you join a group of guys that are somewhat like minded and have the same goals and lifestyle as you. We all get along really well, so I would definitely say that being around the guys and hanging out with them every day is the best part of being on the team. Question: Is it difficult balancing your school work and your involvement with the team? Answer: I would definitely say it’s a challenge, but I like to think I do well at managing my time. Especially now as a fourth-year. It kind of takes you a little while to get in the hang of it and get a routine down, but this is my fourth year. Now, I know what works, what doesn’t work and how to be efficient with my time. When I’m efficient with my time, I have no problem balancing the two. Question: How does it feel being part of a team that broke a historic RIT wrestling record? Answer: It’s a major accomplishment. Before season, we all sit down with the team and see what our goals as a team are, and what our goals as individuals are. It never really popped up that we could have this accomplishment. We had a few other goals as a team, but that was definitely a milestone. Breaking that record was amazing, especially considering the successful teams RIT has had in the past. It feels good to break that record. Question: Are you nervous about competing in the upcoming NCAA Championship? Answer: I would definitely say I’m nervous, but I’m also really excited too. I know I’m well prepared. I’ve been saying all week that I’m just ready for it to be here and that I wish it was this weekend. We are feeling really good right now, so I think we are all just ready to hit it and go. I definitely have some nerves, but that’s normal for me when it comes to tournaments. If you’re not nervous, maybe you should be a little worried. You just have to stay focused. Question: Do you have any routines or traditions that help you get in the right headspace before a match? Answer: I usually try to get to bed at the same time every night and wake up at a similar time to what I’ll be waking up the day of the tournament. I’ll eat a lot of the same foods that I know sit well with me that make me feel good and help me maintain energy through the tournament, but also make sure to eat things that will help me maintain my weight. I don’t really have any rituals or things like that, but some of the guys laugh at me for eating a certain thing the day of the tournament. One time when I was at a tournament in Florida, I went to the grocery store to get some food. I decided to get stuff to make sandwiches so I had something to eat for the day of the tournament, but I couldn’t choose between a peanut butter and jelly sandwich or a turkey and cheese sandwich. So, the next day, I made a regular sandwich with turkey and provolone cheese, but then I put strawberry jam on it so I could have a little combination of the two. I ended up doing really well and winning the tournament, so ever since then, after weigh-ins on the day of the match, I’ll eat that. My teammates think it’s disgusting, but you can’t knock it until you try it. Question: What advice would you give to students who are interested in wrestling and want to try out for the team? Answer: You have to be willing to put in hard work, that’s the best advice I could give. As long as you show up and work hard, it’s never too late to join the team and get better. You get guys who come in from high school who don’t have the flashiest wrestling careers, but then they get to college and they are able to get with teammates who push them and they end up doing really well. We actually have a kid who didn’t try out during their freshman year, but came on the team his sophomore year and he is doing really well. He is our starting 174-pound wrestler. Answer: I haven’t thought too in-depth about it, I’m just enjoying my time here while it lasts because it goes by way too quickly. I’m big into traveling and the outdoors, so I could see myself moving out west and working in a more outdoor-oriented career. I hope I’ll get a job in the civil engineering field, maybe something along the lines of building information modeling or structural engineering.